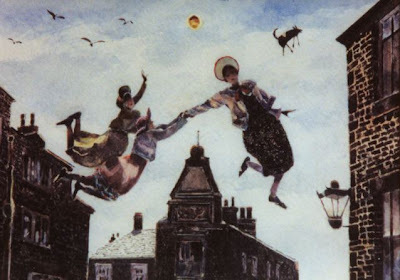 For information on the forthcoming Brussels Brontë Weekend (18 to 20 April) please scroll down a little and click on the link on the right for the Brussels group. All you need to know is there. This one-day conference is on 28 March, organised by l'Université Toulouse II-le Mirail, France (see previous post), with Catherine Lanone, Laurence Talairach-Vielmas and Charlotte Borie as directors. Much has been said about the way in which Charlotte and Emily Brontë transposed the Gothic sense of enclosure and located alienation within the domestic constraints imposed upon women. This colloquium aims to study the ways in which the sisters negotiate the boundaries of self and society and (re)locate or conceal intimacy, especially through the tropes of sincerity and theatricality. Interest may range from the way in which they create a visual world of their own in the juvenilia, pictures, poems, letters or novels— not to mention the essays written in Belgium, which obey and challenge the constraints of form and language. transpositions, from the Victorian performances of Jane Eyre on stage discussed by Patsy Stoneman to twentieth-century rewritings. eldest daughter Lady Tessa Montgomery. At the University of Toulouse, we have created a website to promote a one-day conference on 28 March. We invite everyone to take a look at it here. With a screenplay by Anne Devlin, Kosminsky’s is the first film adaptation to include the whole of the story. The film has spectacular cinematography by Mike Southon, a wonderful musical score by Ryuichi Sakamoto and the dubious distinction of having been spoofed in the Simpsons: Kamp Krusty. Resurgam is the title of an exhibition of paintings, inspired by the Brontës, by artist Bob Littleford, which opened last weekend and will continue until 19 April. 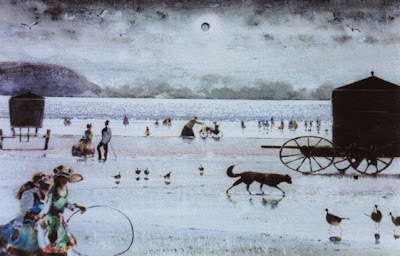 A self-taught artist, Bob Littleford was born in Oldham in 1945 and worked riveting door handles and as a dustman before becoming a full-time artist in the 1970s. He began producing paintings inspired by the Brontës after hearing Bernard Herrmann’s opera adaptation of Wuthering Heights. Resurgam is an exhibition of new work based on his response to the Brontës' lives and works. This exhibition is free on admission to the museum. Parsonage Director Alan Bentley showed a party of six film-makers around last week, all of them connected with Brontë - the movie - which will start filming in May and which is directed by Charles Sturridge. Amongst them was Nick Wild, managing director of Film Squared, the production company based in Holmfirth, Yorkshire. "The party was given a pretty comprehensive guided tour," Alan told the blog. "They were taken behind the scenes and looked at every detail. They were particularly interested in the current exhibition - No Coward Soul. It is still unlikely that the film will include shots of the Parsonage, but Nick Wild is talking about using Haworth. We are now expecting visits from the principals: Natalie Press is coming soon....."
Brontë is being backed by Mel Gibson’s Icon Entertainment production company and was quite a topic of conversation at the recent Berlin Film Festival.